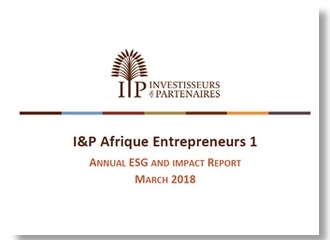 Launched in 2012, the fund I&P Afrique Entrepreneurs 1 (IPAE 1) closed its investment phase in 2017 with two investments in Malian companies, bringing to 29 the total number of African SMEs in portfolio. The publication of the sixth ESG & Impact annual reporting is the opportunity to review the main impacts of the fund and of the portfolio companies, while the successor fund IPAE 2 makes its first investments. IPAE 1’s portfolio counts 29 companies, characterized by a great diversity of sectors (Agribusiness, Construction, Microfinance, Education, etc.) and a strong presence in Least Developed Countries and fragile countries. I&P’s ESG & Impact team also analyses annually companies’ progress on key social and environmental issues, including health insurance policy, employee working conditions and carbon footprint reduction. 2017 was marked by a major event for I&P and all the funds under management: the B Corp™ certification, an independent label gathering mission-driven businesses globally that meet the highest standards of social and environmental performance, transparency and accountability. “The annual publication of the ESG and Impact Reporting meets this requirement for transparency and accountability, which is absolutely necessary to ensure the credibility of the emerging impact investing market” says Jean-Michel Severino, CEO of Investisseurs & Partenaires. “Ensuring high ESG performance and creating positive social and environmental impacts are not merely an option for us: they are the surest route to high financial performance and are the core of the principles that drive our overall mandate”.